Legend has it that the Roman shade is descended from the damp cloth Romans used to hang over their window openings to keep out dust and sunlight and to help keep their homes cool during the hot Roman summers. While there’s plenty of evidence to support the existence and widespread usage of this crude type of window covering there’s not really a lot of evidence to suggest that it actually predates the Roman Shade as we know it. It’s more likely the Roman shade was simply the high-end window covering of choice during the days of the Roman Empire while the damp cloth was the low-end window covering and the two coexisted. How are Cordless Shades Different from Roman shades? 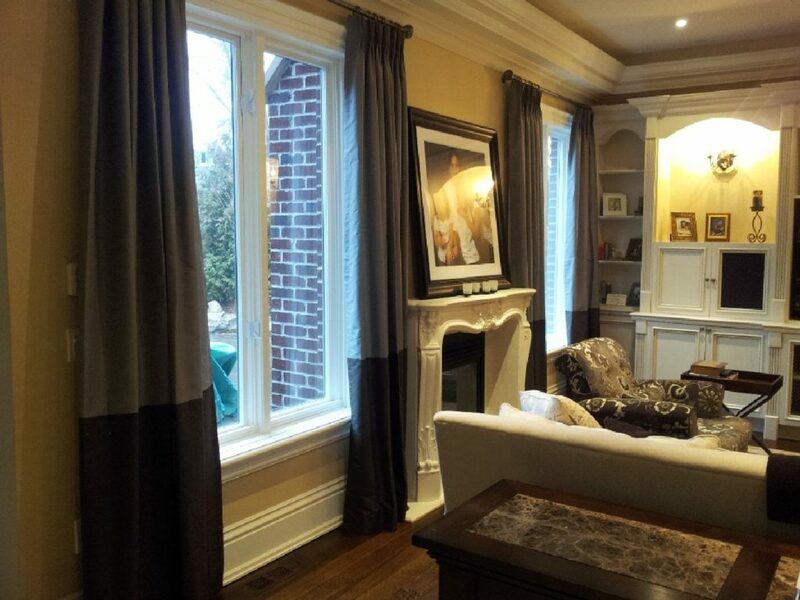 Whatever the exact origins of the Roman Shade it has been a staple window treatment for 2 millennia and given its current popularity in Toronto it seems like it will continue to be the window treatment of choice for countless homeowners for the foreseeable future. And no wonder. It’s simple, elegant, versatile and affordable. All the things you’d expect from a first class window treatment. The basic design and functionality also hasn’t changed since the days when Augustus ruled the Mediterranean world. That is, until now. Sarit Arnesty is proud to announce the custom made cordless Roman shade; the first major upgrade to the Roman shade since the days when gladiators walked the streets of the Eternal City and traveling from Rome to Naples took 6 days by wagon. These sumptuous motorized roman shades provide your Toronto home with the warm, traditional atmosphere only achievable by using the Roman shade and the very modern touch of cordless, automated operation. It’s the best of both worlds and an idea that’s long overdue. Normally, Roman shades have a cord-driven pull mechanism built into them. The cord hangs down at the side of the shade and you pull it or release it to move the shade up or down; much the same as you do with Venetian blinds. Rings are installed on the back of the shade at regular intervals from bottom to top. When the cord is pulled the lowest ring is pulled upward. When it hits the next ring above it a pleat is formed and the upward pull continues. Each succeeding ring creates an additional pleat until a half dozen such folds are created when the shade is fully opened. Once you’ve opened the shade to your desired height you tie the cord off on an anchor attached to the window frame. When you want to drop the shade merely release the cord from the anchor and gravity will pull the shade down. With the new motorized roman blinds from Sarit Arnesty there are no cords and no rings. Just a simple built in, invisible lifting mechanism that can be remotely activated or, if you prefer, activated by hand with a gentle tug on the shade bottom. It may not seem like such a big deal but consider it’s been 2,000 years in the making and that it produces a shade that’s easier to use, safer and more attractive. Let’s look at our revolutionary cordless shade one aspect at a time. Motorized roman blinds from Sarit Arnesty are simplicity itself. Just press the up or down button on your remote and the shade raises and lowers. But it’s not just easier operation it’s better operation because unlike with cord-operated shades the automated operation ensures a beautifully even lift every time. No more having the bottom of your shades hanging lower on one side than the other, no more fidgeting with the cord to try and even things out. Each shade hangs properly and effortlessly inside the window frame. Cordless, remote-operated Roman shades from Sarit Arnesty also fold fewer times than traditional shades, with 4 pleats instead of the 6 or 7 that is standard. And remember the automated lift mechanism can be activated by hand if you want. Our revolutionary cordless shades have no unsightly rings in the back and are constructed using a proprietary stitching method that produces a clean, efficient look. By employing 4 pleats instead of the customary 6 or 7 a more tailored contemporary profile is created that updates the classic look without turning its back on it. A roller shade is also incorporated into the back of our shades to provide a neat appearance from the street that enhances the curb appeal of your home. 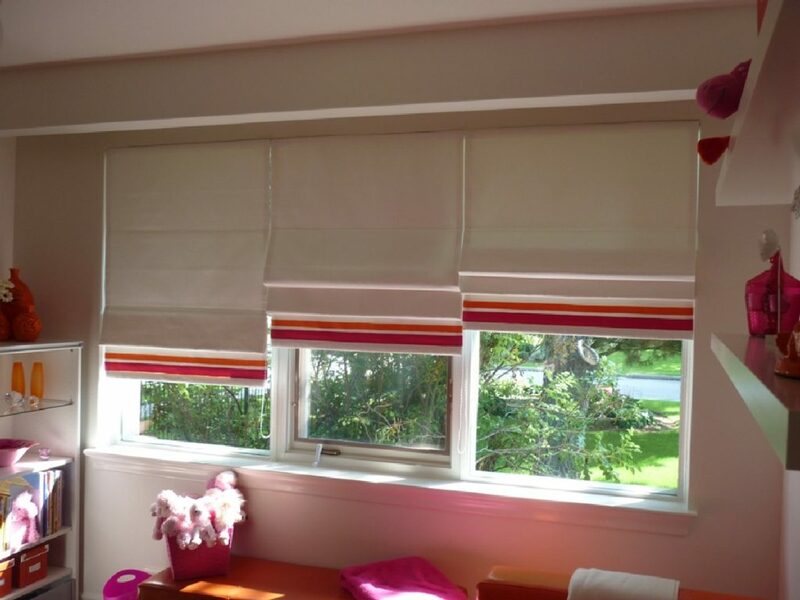 Safety – With traditional Roman shades there was always the concern that young children may release the cord from its anchor and the shade may come crashing down on them. While Roman shades don’t typically weigh so much that this would be considered a life or death issue toddlers could still experience a severe bump on the head or bruised hands, head or feet. In addition, there was always the risk that young children or even pets could become tangled in the cord leading to painful injuries. When it comes to motorized roman shades these concerns are all things of the past. Aesthetic versatility – Cordless Roman shades can be used to serve a variety of aesthetic masters. By simply changing the fabrics and colours involved they’ll look just as well suited in the parlour of your Victorian Toronto house as they will in the living room of your modernist masterpiece. Whether you’re out to create a casual or formal ambiance or an interior that embraces Continental design cues or those of Asia, Africa or the Subcontinent cordless Roman shades by Sarit Arnesty are the solution you’ve been searching for. Enhanced privacy – With a heavy-duty roller shade providing backing our breakthrough Roman shades ensure your home is safe from prying eyes day and night. They also provide a blackout component that is perfect for those who need to sleep during the daytime because they work non-traditional hours or just for those who enjoy taking a nap in the afternoon. Affordability – Cordless Roman shades from Sarit Arnesty are one of the most affordable luxury window treatments you can buy. When considered alongside all their other benefits this may be the one that seals the deal for most people. Low maintenance – Our cordless Roman shades are extremely low maintenance requiring little more than a dusting now and then to keep them looking great. Not convinced? Well here are some more reasons to make the switch to automated motorized roman shades for your Toronto home. Design trends today lean heavily on the notion of masking various elements of your interior decor that are not key contributors to the overall design. This then enhances the strength of the core design cues and buttresses the overall effects you’re trying to obtain. Certain kitchen appliances, for instance, can be ordered with custom finishes that allow them to blend in with their surroundings rather than distract from them. In the same way motorized roman blinds from Sarit Arnesty, by removing the dangerous and distracting cord from the equation, achieve a higher degree of integration with their surrounding elements and provide a more pleasing overall look for your room. While lifting and lowering standard Roman shades isn’t rocket science it can sometimes be tricky to get them to raise smoothly and to come to rest evenly at either the top or the bottom of the window frame. Motorized roman shades by contrast always provide smooth, even movement, consistent folding of the material at the pleats and the added benefit of no longer having to untie knots in the cords. Traditional Roman shades can, like other types of cord-operated shades, generate a bit of confusion when it comes to trying to figure out which cord to pull in order to level the blinds off. Our cordless Roman shades by contrast remove this type of confusion from the equation once and for all and lift and drop perfectly every time. Now that you know all the great reasons to have motorized roman blinds installed in your home the only question that remains is; “How do I pick just the right style of cordless Roman shade for my home?” It’s a good question and below we offer some advice on the various factors to consider when weighing which cordless Roman shades to install. One of the great things about our motorized roman shades is that they’re available in an almost unlimited number of colours, patterns and fabric textures. The first step in determining which style of cordless shade will be right for a particular room begins with choosing the right fabric. Typically you’ll be able to choose from cotton, silk, linen and a variety of polyester blend fabrics for your Roman shades. In most cases if you’re trying to achieve a warm, homey look and feel for a room the natural fabrics will be the way to go (with linen a particular favourite these days). If it’s a more contemporary atmosphere you’re trying to achieve you may want to consider a polyester fabric with a more insistent finish that melds with the harder, more minimalist textures in the room. Once you’ve selected the fabric that will work best with materials in the room it’s time to select a colour or colours that will work off of the established colour scheme. Solid colours reinforce a simple aesthetic and will be appropriate if the upholstery on your furniture, along with your wall colours, tend to be monochromatic. If the other elements in the room like the upholstery, pillows, throw rugs and the like are patterned you may want to introduce a complementary pattern into the Roman shades. Be careful not to overdo it though. 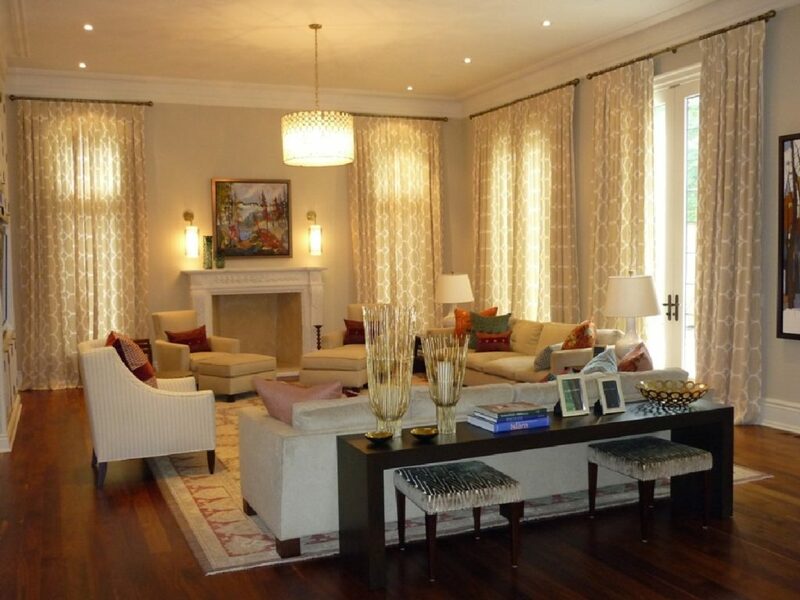 You want the motorized roman blinds to work with the existing decor, not overwhelm it. Our cordless Roman shades are backed by a roller blind to provide a pleasing look from the outside. These liners can also be used to block out the sun if that is something that appeals to you. These backing blinds are available in a variety of opacities to achieve exactly the degree of privacy or sun blocking ability you want. These liners won’t change the overall look and feel of your decor. They’ll simply provide an additional layer of privacy or environmental control when you need it or want it. The Roman shade has been a fixture in homes for 2,000 years because it’s easy on the eye, makes your interior more attractive and comfortable, can be adapted to a wide range of decors and won’t bust your interior decoration budget. Today, for the first time in centuries, they’ve been enhanced by the artisans at Sarit Arnesty and brought into the 21st century by way of automation. If you’ve considered Roman shades in the past but had been turned off by the prospect of having to go through the rigmarole of working the cords, or you have young children and didn’t want cords hanging where they may come in contact with your kids, motorized roman shades from Sarit Arnesty in Toronto are the design solution you’ve been waiting for.